I bloody love mince pies. I can hoover up a few in one sitting, they are so Christmassy and delicious. Every year December rolls round and I’ve forgotten just how tasty and moreish they really are! I have one ‘go-to’ recipe and it’s Nigella’s: this year I decided to try it vegan. This was easily achieved by switching the butter to vegan spread and omitting the egg. The pastry is still light and crisp, and a little flaky too: a perfect encasement for spiked mince meat. Jarred mincemeat is fine but I like to perk things up a bit with a splash of whisky, it improves the spicy fruit mixture no end without leaving an alcoholic aftertaste – that is unless you make that dram a double measure! A little grated apple adds extra moisture and freshness too, more home-made if you like. 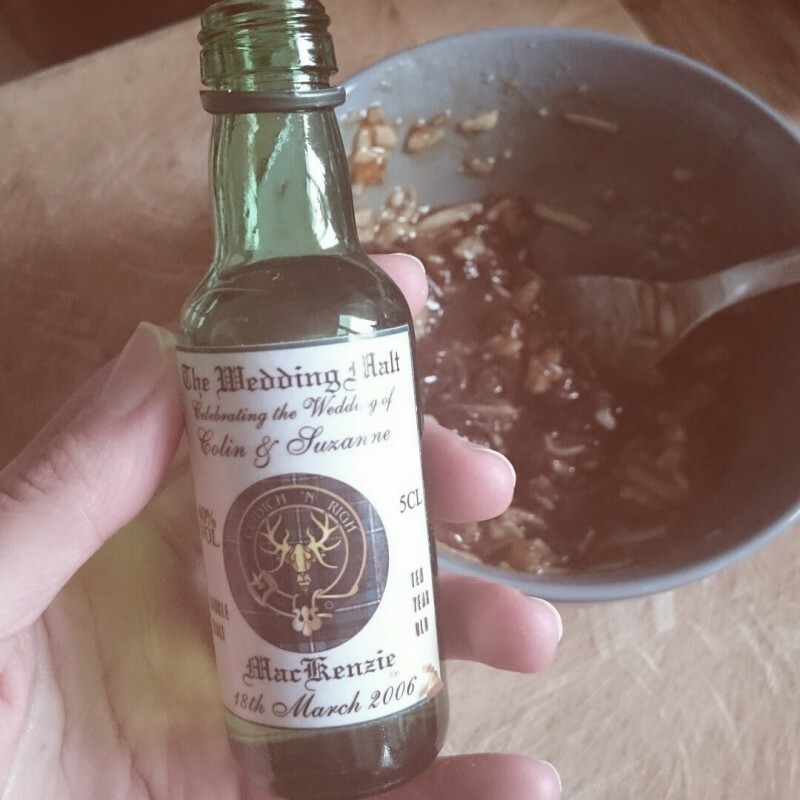 Sorting through a few things recently I found a miniature bottle of Scotch Whisky that had been a wedding favour: a wedding that had taken place in 2006! I think it was about time I put this dinky bottle to good use, from one festive occasion to another. The first one was a shock to my festive system. I was in New Zealand and the only mince pies I could find were made with animal fat. I was devastated: so close yet so inedible. The Christmas spent in China was never going to include mince pies, I knew that. Although had I been in Shanghai I could probably have got a box in Marks and Spencers. Alas, Yangshuo had no Markies. Last year I was in Germany, and to be honest after all the super-festive food and drink I’d eaten throughout that December in Sweden, Finland and Germany I really didn’t miss them too much. 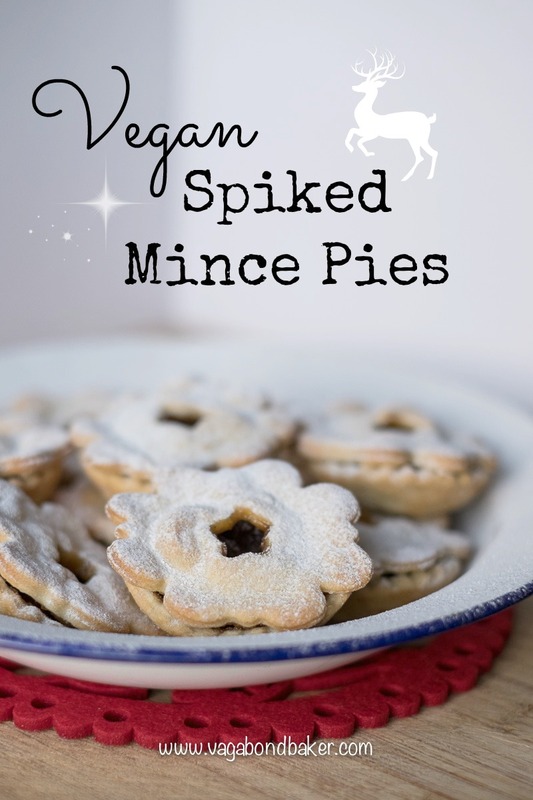 This year I’ve already consumed my body weight in mince pies – all in the process of perfecting these vegan pies, of course! One or two shallow 12 hole tart tins. If you only have one you’ll have to work in batches. Makes around 24 mince pies. I prefer, for speed, to make the pastry in a food processor. If you wish to make it by hand, don’t bother chilling the flour and fats, and rub together with your fingertips to make crumbs. You could use pre-made vegan shortcrust pastry too for even more speed! 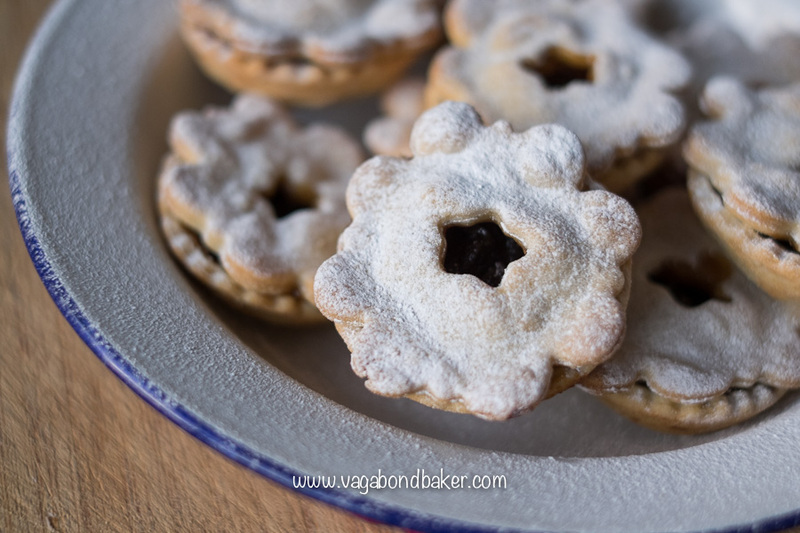 The pastry is a veganised version of Nigella Lawson’s Star Topped Mince Pies from ‘How To Be A Domestic Goddess’ – a recipe I have used for years. Measure out the orange juice and add a pinch of salt to it. Put this into the fridge. Place the flour into a bowl or container and spoon in the fats. I do this on top of my digital scales zeroing before adding the next fat. Give it a toss around to coat the fats in flour. Pop into the freezer for 20 to 30 minutes to chill right down. Once cold transfer into a food processor and blitz to crumbs. Tip out into a mixing bowl (I do this step by hand as I can gauge the consistency better) and add the cold salted orange juice bit by bit, ‘cutting’ it in with a table knife until it begins to come together. You may not need all the juice. Use your hands to finally bring it to a dough. Halve it in two and wrap each piece in clingfilm. Chill again, for around half an hour. Preheat the oven to 200 º C.
In the meantime, spoon the mincemeat into a bowl and stir in the grated apple. Add a splash of whisky, stir it in and give it a taste: does it need more? Roll out one of the chilled doughs to about the thickness of a pound coin on a flour-dusted work surface, cut out 12 circles and line your tart tin. Cut 12 lids, either a smaller circle or any other cute cutter shape. Gather and re-roll the scraps. Spoon heaped teaspoons of the spiked mincemeat into each tart and top loosely with a ‘lid’. Bake for 10 – 15 minutes until crisp and golden. Use a spoon to flick the cooked tarts out onto a wire rack to cool. Let the tin cool while you roll out the rest of the pastry, repeat. Once cool, dust festively with icing sugar. Sunday Musings: Shetland – My Photos Have Been Included in a Beautiful Book! Come and flick through it with me. Sunday Musings: Snow Vanlife! Living in a camper van over Scottish winters. Sunday Musings: Speaking French Realising my high school French lessons had not been in vain, in Grenoble. Sunday Musings: The Northern Lights In Yorkshire! Yes, really! And I have photos to prove it! Do you love Mince Pies as much as I do? What festive treats do you miss if you spend Christmas abroad? 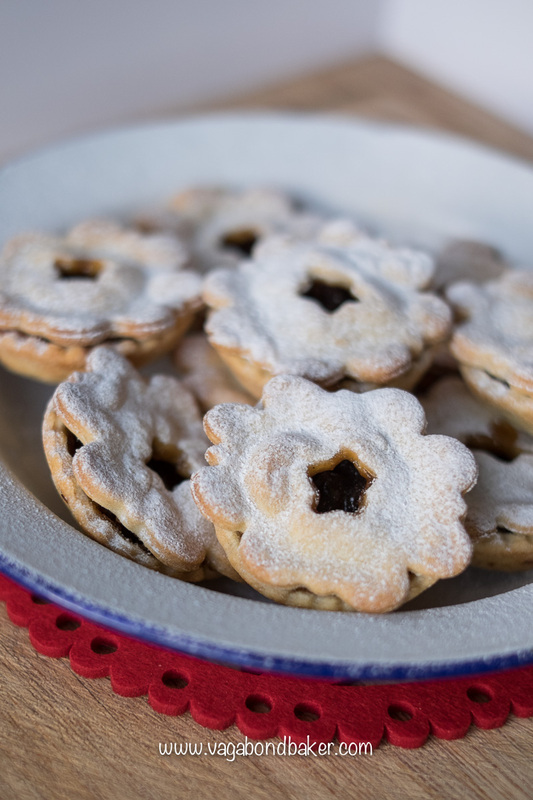 These mince pies look amazing, Rachel. I love mince pies, but I usually buy a pre-prepared box. One of these days I’ll have to get around to making them myself. Thanks Jennifer! I love homemade ones, there is just something even more Christmassy about them! I’ve got into a bit of a festive routine formed now where I can’t wait to make them as soon as December arrives! Even if you just buy pre-made pastry, you can have a bit of fun spiking the mincemeat and constructing them.